The increasing crisis in international relations is rooted in Western nations’ lack of morals and their reluctance to observe basic norms of international law, State Duma chairman Sergey Naryshkin has said. “The tensions in the international situation have seriously increased over the past few years and this happens primarily because a group of Western nations, first of all, the United States of America, are neglecting the major principles of international law or interpret them freely,” Interfax quoted the Russian parliamentary leader as saying at a meeting with law students on Monday. “I would be more direct – it happens due to the lack of morals,” Naryshkin added. He emphasized that the argument of “American exceptionalism” often used by many US politicians was against not only the legal principle of equality of all nations and peoples, but also contradicted basic human morality. The Duma speaker also said that at the moment he considered Russia as the key protector of the basic foundations of international law. He noted that as one of the victor nations in World War II, Russia played a decisive role in introducing international law and that it had paid a great price for this achievement. 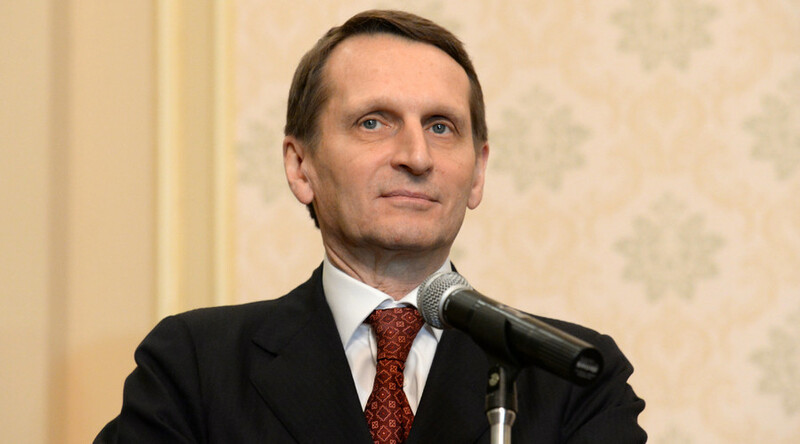 In May 2015, Naryshkin published an article in the Rossiiskaya Gazeta daily in which he urged European politicians to stop heeding advice from the United States and to start working on common Eurasian economic interests with Russia. If this doesn’t happen, Washington will eventually destroy the EU’s economic sovereignty by skillful manipulation of WTO mechanisms, Naryshkin wrote. Naryshkin has also backed the idea of a future merger between the Russian Federation and the European Union, and in April 2015 he suggested immediately starting consultations. The idea of the possibility of such a merger originally came from Czech President Milos Zeman, who confessed to having a dream that one day Russia would join the EU.